With almost everything getting expensive these days, it's just wise to find better shopping alternatives. Looking for new establishments to buy our family's need is a practical thing to do to save money. And you'll be surprise that some quality products can be found cheaper in tiaange or thrift stores. One great place to visit is the Tutuban Center in Manila. Even with similar bazaars sprouting all over the metropolis, the Tutuban Night Market is still the most visited and the one with the widest array of goods on display. The Tutuban Night Market is conveniently positioned around the clustered malls of the Tutuban Center, which was formerly the Philippine National Railways station. A leisurely stroll around the restored heritage building gives you a glimpse of historical pride. As the Tutuban Center closes for the day, shoppers need not worry. Stalls selling your favourite things---and more---are ripe for the browsing. From clothes to decor, from toys to furniture, from food to novelty items, a collection of brightly-lit stalls are ready for the night shopper. Like the famous markets in Bangkok, Hong Kong, Taipei and Kuala Lumpur, the Tutuban Night Market is dedicated to the discount hunter. Haggling and negotiating over prices is the standard practice, and goods all come at cheaper and reasonable rates. But Tutuban Center has an added advantage. Because the Philippines is a melting pot of foreign influences, there are merchandise that are gathered at the night market from all over Asia and the world. You don’t need to travel to these places to shop. The items you want may just be at Tutuban! Fancy a set of delicate dishes? There are ceramic plates from China. Feel a little love of Siam? Wear shirts from Bangkok with interesting details. Want to feel like royalty? Grab those bejeweled bangles from South Korea. Or, are you imagining yourself like Kate Middleton? Get those charming straw hats with ribbons and bows and pretend that you’re at Ascot watching a celebrity horse race. What’s more, because we have a wealth of artisans in the countryside, there are handicrafts, souvenirs and indigenous products that are uniquely and distinctly Pinoy. Colourful lamp shades made of grass can enliven your home and garden. Wood and stone carvings can take pride of place in your bookshelf or side tables. Purses and wallets created from knits and crochets can be nice gifts. After a thoroughly enjoyable turn around the stalls, there is Food Bazaar located at parking D that offers a wide variety of snacks quick snacks like burgers, takoyaki, pansit, batchoy, fish balls, squid balls, kikiam paired with sago’t gulaman, buko juice and sodas. Over at the back and at the parking lot is the Food Street to satisfy your cravings for good, old comfort food. Take a sip of hot soup, a bite of pork barbecue or grilled squid. With extra rice, of course! All these and more only at Tutuban Center Night Market! To support the government and private efforts to fasten the recovery of the many areas in Japn that was struck by the killer quake last year, UNIQLO announces the launch of its next phase of assistance to the revitalization of communities in the Tohoku Region that were most affected by the Great East Japan Earthquake that struck on March 11, 2011. Under this project, known as the UNIQLO Recovery Assistance Project, the company will partner with five NGOs for three years and open new stores in the hardest-hit communities. 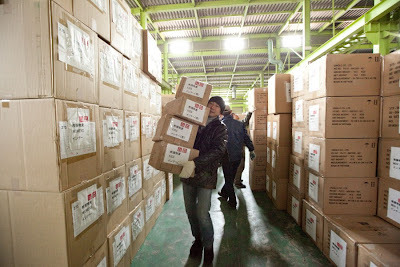 Fast Retailing Group companies led by UNIQLO have been actively working with affected local communities since soon after the disaster struck, donating funds and relief supplies, as well as sending volunteer staff to distribute clothes to people in need. Working directly with these communities over the last year has given UNIQLO a clear understanding of their immediate needs and hopes for the future. The UNIQLO Recovery Assistance Project was shaped by this experience. Through this project, UNIQLO aims to provide long-term support to communities in need and make a contribution to revitalizing Japan. UNIQLO will work with five NGOs to support programs in devastated communities in prefectures such as Miyagi, Iwate, and Fukushima. The focus of these programs is to help these communities rebuild, create employment and become independent of aid. With this in mind, UNIQLO will open temporary stores in Kesennuma, Miyagi Prefecture and Kamaishi in Iwate Prefecture --- two of the hardest-hit communities. UNIQLO will also reopen a store in the Haramachi district of Minamisoma in Fukushima Prefecture which was temporarily closed following the March 11 disaster. UNIQLO is committed to contributing a total of 300 million yen (around 3.7 million USD) to NGOs working on the ground to help devastated communities rebuild and become self-sufficient. Each of UNIQLO’s five NGO partners will receive around 20 million yen a year for three years. A portion of sales at all UNIQLO stores in Japan in March 2012 will be donated to this Project. UNIQLO is also offering customers the opportunity to directly participate by launching a three-month donation drive at all UNIQLO stores in Japan, starting March 1. In addition, UNIQLO and the Fast Retailing Group are planning to offer employees opportunities to work as volunteers at partner NGOs. While visiting disaster areas to distribute clothes, UNIQLO volunteers were often told by local people that they looked forward to the day when UNIQLO returned to open a store in their neighborhoods. Now, UNIQLO is pleased to be able to open temporary stores in some of the hardest hit communities. Through these stores, UNIQLO will offer local people a specially selected lineup of great, affordable clothes, as well as new employment opportunities. UNIQLO are honored to welcome customers to these stores: UNIQLO Kesennuma Store; Kamaishi Store and Haramachi Store. Today UNIQLO has more than 1,000 stores worldwide, namely in the U.S., U.K. France, Russia, China, Hong Kong, Taiwan, Singapore, Malaysia, Thailand and Korea, as well as Japan. UNIQLO continues to open large-scale stores in some of the world's most important cities and locations, as part of its ongoing efforts to solidify its status as a truly global brand. UNIQLO operates an integrated business model under which it designs, manufactures, markets and sells high-quality, casual apparel in line with its ‘Made for All’ philosophy.